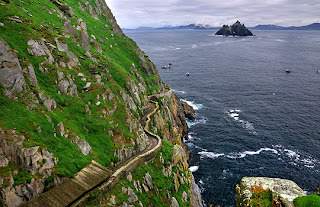 Skellig Islands is popular tourist attractions in Ireland which has magnificient view throughout all history and beyond. 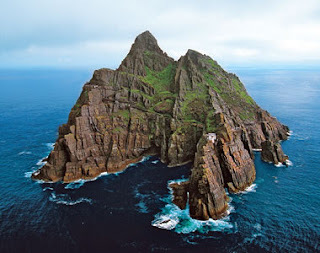 Located almost 8 miles off the West Kerry coast, is one of the most mysterious attractions in the Kerry area, Ireland. The Skellig Islands from a distance they look like floating pyramids of sandstone. ImageUp close they look rugged and uninviting. After a cold and often rough boat trip, there are almost seven hundred steep steps to greet you on your arrival. The tiring climb up the steps is not for the faint hearted. The earliest reference in history to the Skellig Islands dates back to 1400BC. During the time of the Penal Laws, Skellig Michael and Little Skellig became a haven for many Catholics whose beliefs and rights were being suppressed. The largest of the Skelligs is Skellig Michael (Sceilg Mhichil) and was home to one of the earliest monastic settlements in Ireland. There is a fantastic wealth of bird life on and around the Skelligs, especially puffins in late spring and gannets on the small Skellig where 23,000 pairs nest on every available ledge making it the second largest gannet colony in the world. There are many things that you can do in Skellig Island, it is a fair climb to the monastery from the pier where the boats land. The current landing site was built in 1820; the site the monks used is no longer in use. You can still see the massive stairway the monks built back then. On the climb up you can get the most breathtaking views of Kenmare Bay, Ballinskelligs Bay and in the distance the Dingle peninsula. There are numerous small companies that can organise a boat trip for you. You can start of in Caherdaniel, Waterville, Valentia, Portmagee and Caherciveen.